BOARDS AVAILABLE FROM 5ft11 TO 7ft4 these range from the high performance boards to boards for the heavier rider. 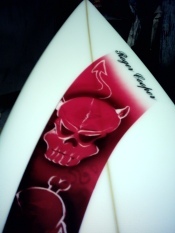 All boards come with variety of tail designs ie. square, swallow, rounded,pin,and all come with FCS fin systems. A variety of colour and design options are available. Scroll down to see just a few examples!! Description HIGH PERFORMANCE SHORT BOARD FOR WAVES IN THE 3-6 FT RANGE. WITH FCS FINS. CAN ALSO BE CUSTOM MADE TO YOUR PERSONAL SPEC. Description Shaped by chris grifiths, standard short board. Any size available. Description Very latest fish. With carbon fins, set in Triple FCS.. OR a quad set up! Description Standard short board made to any size. 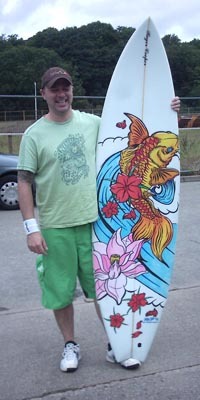 Description Fish tail short board with posca art by Ralph . 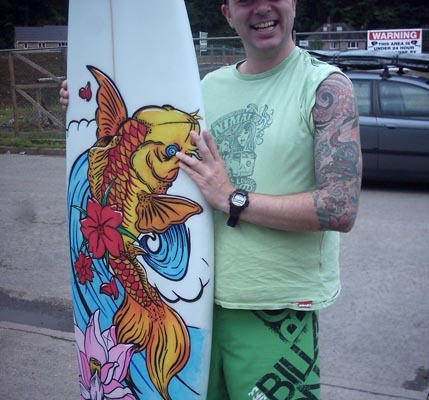 Description wide tail retro fish board with posca art by Steve. 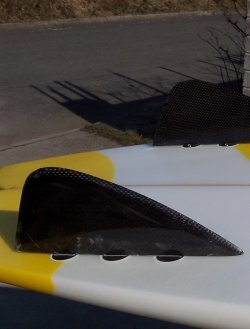 long base carbon twin fins(triple fcs fixing)OR works well as a Quad set up! Description Modern fish with wings. new art design by Ralph. Thruster or Quad set up! Description Fire skull by Ralph! colours as seen, or similar to customers design! Description Short board with a diffrence, Made a little bigger for surfers progreesing from a mini mal! Other sizes to order ! colours As seen or to customers design! colours This was to customers design! Description Shortboards to order. This one has posca art by Ralph. Dimensions Custom orders from 5ft 10"
Description Tiny board for a good young surfer. colours Posca art by Steve.